Lumishore, the world's leading manufacturer of high performance Underwater LED Lighting Systems, is the proud recipient of NMEA 2015 Product of Excellence Award. Lumishore is delighted to be announced as the winner of the inaugural NMEA Underwater Lights 2015 Product of Excellence Award. 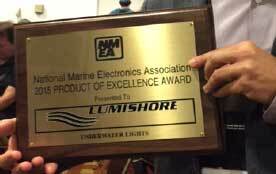 The NMEA industry awards recognize excellence in design, performance and reliability in marine electronics products. The awards are determined by votes restricted to marine electronics dealers, distributors and NMEA industry professionals. This year's award was extremely competitive, with a category focused exclusively on underwater lighting for the first time ever in the NMEA Awards. Lumishore's revolutionary EOS colour changing underwater lighting system won this inaugural Underwater Lights Product of Excellence by a clear margin and with overwhelming support from NMEA dealers. Commenting on the award, Lumishore Sales VP Les Ares says : "It's simply brilliant to receive this recognition and validation for Lumishore in NMEA's inaugural Award for Underwater Lights Product of Excellence, which is true testament to our unrivalled EOS systems and our excellent team. I must thank all who supported Lumishore and who voted for the Lumishore EOS Underwater Lighting system." Reconfirming Lumishore's unrivalled world leadership in creating beautiful, high performance Underwater LED lighting systems, this latest NMEA award further reflects Lumishore's unique innovation, driven by the company's investment in R&D. Lumishore's world-class expert team develops the best and most beautiful underwater lighting effects for the leisure marine sector, leading the market with highly innovative products including the revolutionary EOS Colour Change Underwater Lighting System with its totally unique features.